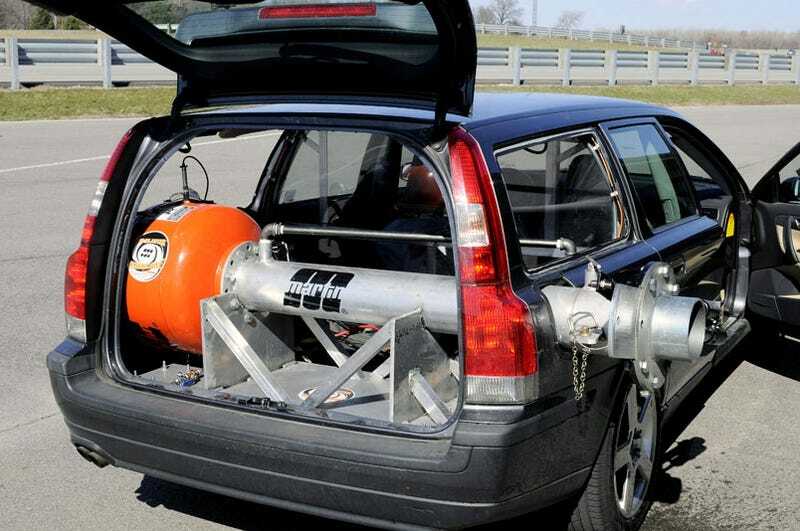 Ford engineers have rigged a giant water cannon to a Volvo V70R to test effects of a side-impact crash without the crash. Better news? Ben's trying out this Carpocalypse-level technology as we speak. More below. Using a Martin Engineering Hurricane Cannon, the test driver can pilot the car as normal and, with the push of a button, simulate the force of a car striking the back of the car. They then take the test data back, plug it into the computer, and devise new ways to tweak the stability control. Blah, blah blah. We think this would be an awesome car-to-car weapon. Imagine someone in another car is trying to run you off the road with a PIT maneuver but, as they approach, you let the water cannon knock them into the ditch. This is the kind of fun you get to have when you're not encumbered by bankruptcy, we guess. Ford researchers also use a water cannon test to analyze how a moving vehicle reacts to being struck from the side, without putting test vehicles and drivers at risk of damage or injury. Researchers say the new test could prove useful in the development of next-generation stability control technology. In this highly coordinated maneuver, Ford engineers mount an air-powered cannon – a tool commonly used in mining operations and pumpkin-throwing contests – in the rear compartment of a test vehicle. The cannon blasts water outward, causing a recoil impulse that forces the vehicle into a skid. Engineers use the test data in computer simulations to help study how to enhance stability control technology, reducing risks to test drivers and damage to test vehicles. "It's a very effective test that demonstrates the ingenuity of our engineering team to think outside the box," said Jeff Rupp, manager, Ford Active Safety Systems Engineering. "We know of no other automaker doing anything quite like it." According to the 2008 New Vehicle Customer Study, safety features account for one of the top ten reasons why Ford buyers chose their vehicle. More than 53 percent of Ford buyers indicated that safety features are "extremely important" in their decision to purchase a Ford vehicle. "Ford's efforts to advance vehicle safety are driving more car buyers to the brand," said Mike Harper, brand and tracking manager, Ford Market Research. "And their interest in safety continues to fuel innovation among our vehicle designers and engineers."